Found 6 file extension associations related to T-FLEX CAD and 1 file format developed specifically for use with T-FLEX CAD. T-FLEX Parametric CAD is a full-function software system providing mechanical design professionals with the tools they need for today’s complex design challenges. 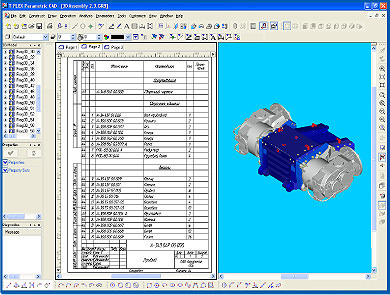 It unites powerful parametric 3D modeling functionality with the parametric drafting and drawing production toolset. T-FLEX Parametric CAD is an industry leading mechanical design system with flexible and intuitive workflow and superior design capabilities. The technical innovations and productivity advantages have made T-FLEX one of the most robust and versatile parametric modeling and drafting solution for product development. Its extensive set of tools makes T-FLEX the best choice for meeting any professional challenge. T-FLEX is used extensively for everyday mechanical design applications including 3D/2D design, drafting, conceptual sketching, reverse engineering, tolerancing inspections, rapid prototyping, and downstream manufacturing. If you need more information please contact the developers of T-FLEX CAD (Top Systems Ltd), or check out their product website.